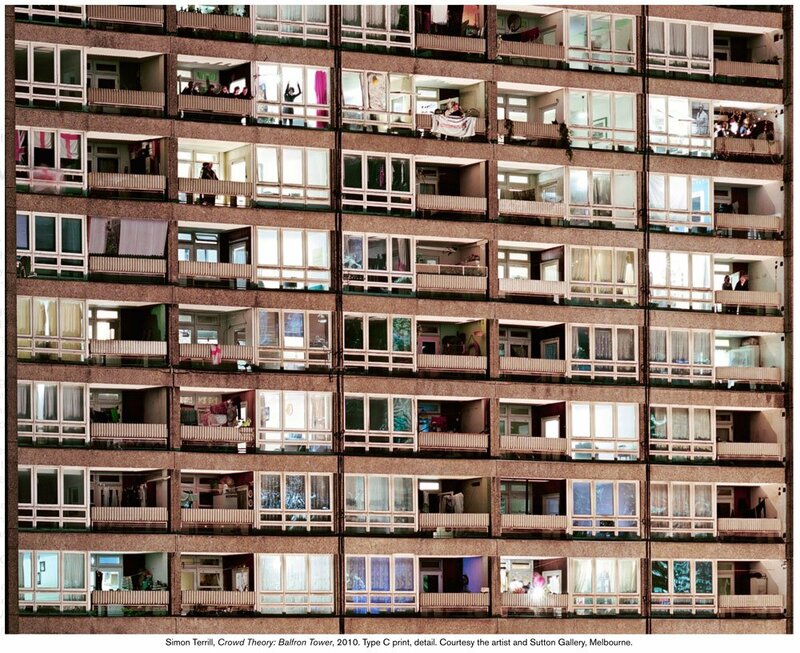 Centre for Contemporary Photography (CCP) is presenting a major survey of the monumental Crowd Theory photographs by Melbourne-born, London-based artist Simon Terrill. The exhibition explores crowd dynamics and the relationship between urban architectural spaces and those who inhabit them. Crowd Theory (2004–2018) is an ongoing series of photographic and performance-based events, where artist Simon Terrill engages with urban groups, inviting people to imagine their own idea of place. The first iteration of the work took place at Footscray Community Art Centre in 2004 and the most recent event was staged in Thamesmead, London. For each project, an invitation is made to anyone and everyone with an association to each site to come together for a single, yet collective photographic portrait. Participants are specified the time of the event—but choose how to represent themselves—creating socially charged spaces that reveal tensions between public and private identities, and complex politics surrounding urban habitation. Each Crowd Theory work involves extensive collaboration, through the mobilisation of up to 300 people, as well as the coordination of lighting, soundtracks, smoke machines, catering and marshalling, creating a theatre-like atmosphere. For the exhibition at CCP, Terrill will show the full suite of ten mural-sized photographs together for the first time, alongside a new sculptural work, a catalogue publication and a series of associated public programs and events. Simon Terrill is an Australian artist based in London. Working with photography, sculpture, installation, drawing and video, his work explores architectural spaces and their received narratives, public and private identities, and the idea of the crowd as a tool to examine architecture, identity, community and a performance of self. His ongoing Crowd Theory project consists of large-scale stage-managed public events resulting in exhibitions at the sites of their creation along with collaborations with museums and public galleries to extend the images and stories outwards. Terrill’s practice began in performance, including co-founding Snuff Puppets Inc in the early 90’s. Following a BA in Sculpture and MA in Fine Art at the Victorian College of the Arts in Melbourne, he lectured in Critical and Theoretical Studies (2005-08) and at the Centre for Ideas (2003-08), both at the VCA. In 2008 Terrill was awarded the Samstag International Visual Arts Scholarship, spending a year at the Slade in London. Recent works have been shown at the National Portrait Gallery London, Crowd Theory: South of the River, 2016; Andrew Brownsword Galleries, University of Bath, Parallel (of Life and) Architecture, 2017 and The Brutalist Playground, a collaboration with Assemble Studios, commissioned by the Royal Institute of British Architects and touring internationally. He is currently a Somerset House Studios Resident.